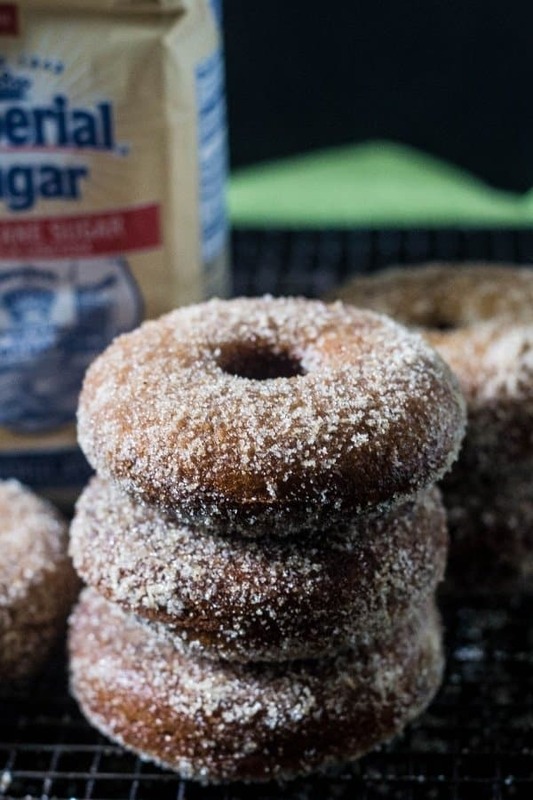 Pour a glass of milk or hot chocolate and enjoy these apple cider donuts! Apple Week is in full swing! Sunday I shared Cider Braised Chicken and Cabbage! We love it and I hope you do too! I know Monday was not an apple recipe, it was Instant Pot Swedish Meatballs! Long story short, I had to write a recipe for a company and that was their requested date! So back to apples today! My friends, let’s talk about my Baked Apple Cider Donuts! Holy mackerel, these are amazing! Last fall, after a trip to a local farm where we enjoyed fresh apple cider donuts, I was determined to make homemade cider donuts! Boy, was I glad that I did! These baked donuts are delicious! These donuts have been a work in progress for some time! I finally had the donuts but then the cinnamon sugar wasn’t quite right! 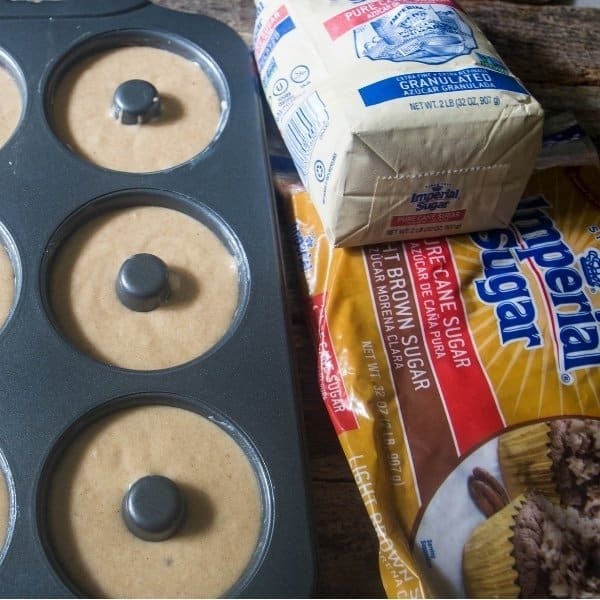 When I found out that Imperial Sugar is one of our sponsors for Apple Week I had an idea for the cinnamon sugar topping. I mix brown and white sugar with cinnamon and nutmeg for the topping. Well, everyone, that works beautifully! The key is to take the donuts out of the oven and pop them onto a cooling rack for 2-3 minutes. Then, brush the donuts with melted butter and then dip them into the cinnamon sugar. 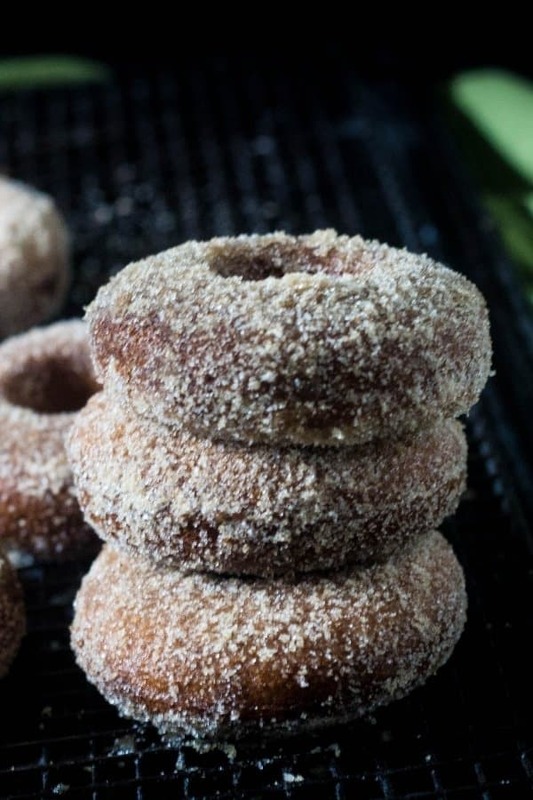 Place the cider donuts onto a wire cooling rack and hello delicious! 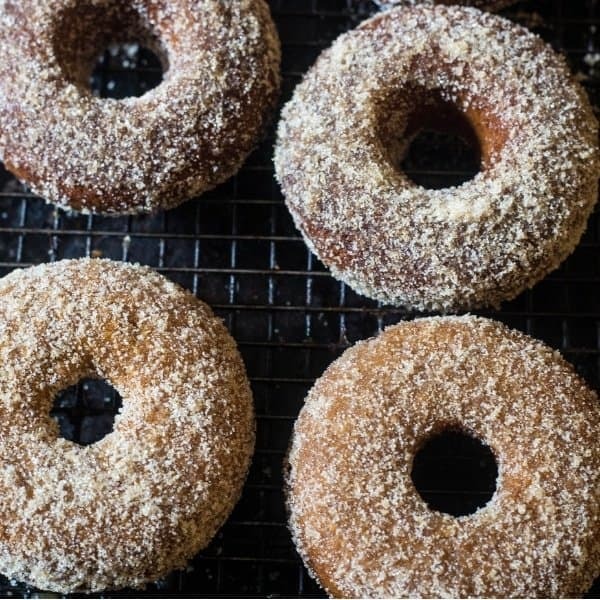 What type of apple cider is used to make these Cider Donuts Recipe? Personally, I love making homemade slow cooker apple cider. The house smells amazing also! We know that’s not always possible. In the US, apple cider is usually easy to purchase. For my friends outside the US, this is not a hard cider, it is alcohol-free apple cider. 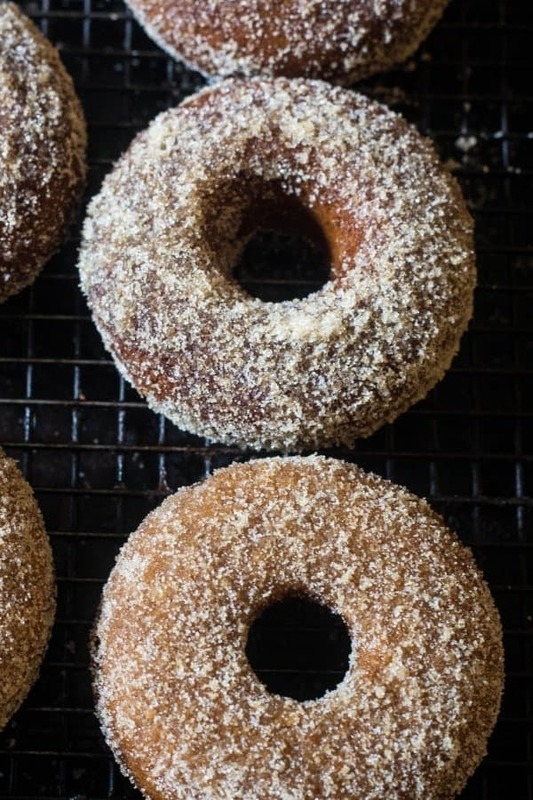 Can Baked Apple Cider Donuts be frozen? Absolutely! I make a big batch of cider donuts and freeze them. I bake them, add the cinnamon sugar topping. I wrap each donut in plastic wrap and then into a freezer bag. Label the bags with the date and date to use by, 3 months later. To defrost, place in the fridge overnight. Warm at 300 degrees in the oven for a few minutes. 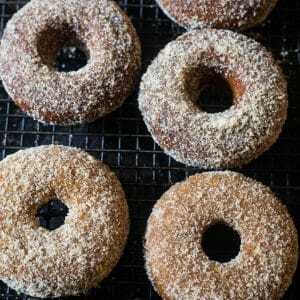 What goes well with Apple Cider Donuts Recipe? My apple cider donuts are baked! So they are already healthier than a fried donut! Making cider donuts at home uses no preservative. Baked apple cider donuts take 10 minutes prep and 15 minutes to bake = 25 minutes to deliciousness! Bonus: these cider donuts freeze well too! I defrost overnight. Wrap the donuts in foil and heat them up for a few minutes, yum. Preheat the oven to 350 degrees. Spray a donut pan with non-stick cooking spray. Set aside. 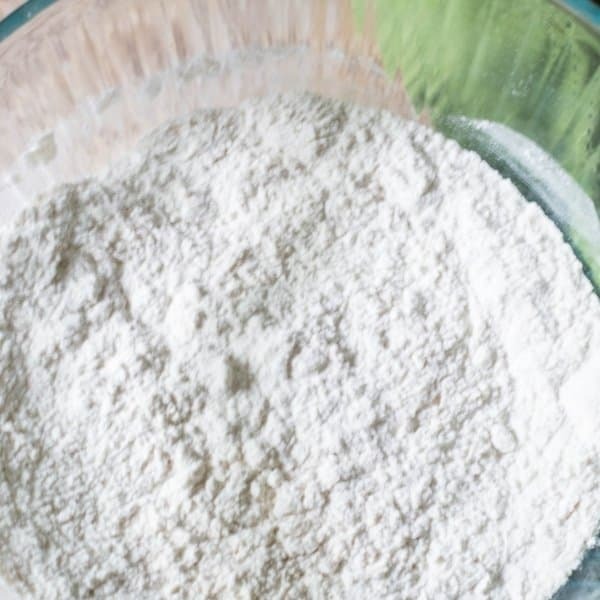 In a medium bowl, combine and stir flour, baking soda, baking powder, cinnamon, and nutmeg. In another medium bowl mix together the apple cider, buttermilk, and vanilla extract. 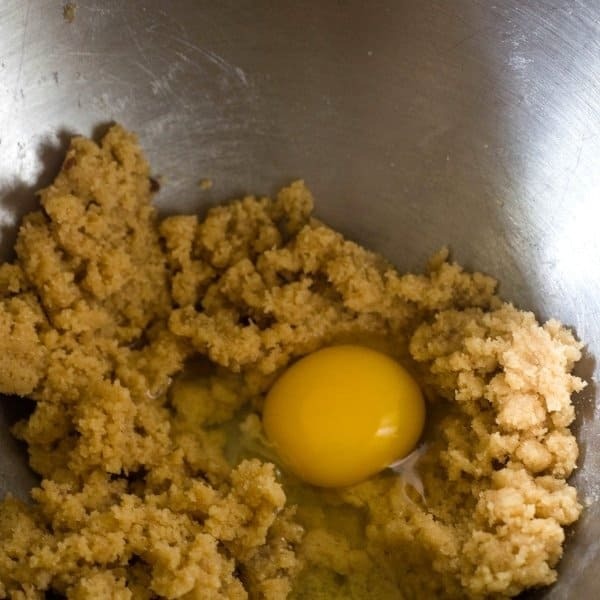 In a large bowl beat together butter, brown sugar, and white sugar. 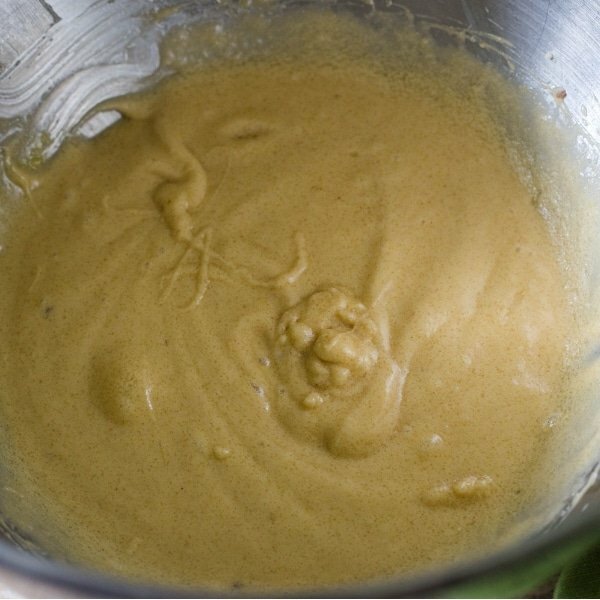 The butter/sugar mixture should be well blended. See photo under #6. Add in 2 eggs, one at a time to the sugar mixture. Mix in half the cider mixture and half the flour mix. Gently fold ingredients together. Add remaining cider mixture then the remaining flour mixture. Once blended. Use either a piping bag or a large plastic storage bag to put in the apple cider donut batter. Cut a hole in corner of plastic bag to pipe the batter into the donut tins. If using a piping bag, use a tip with a round hole. While the donuts are baking. Melt the butter in a saucepan. Can use a microwave. In a bowl, mix together 1/2 cup brown sugar, 1/2 cup white sugar, 1 teaspoon cinnamon, and 1/4 – 1/2 teaspoon fresh nutmeg. One the donuts are out of the oven. Let them cool on a wire rack for 2-3 minutes. Brush donuts with the melted butter then dip the donuts in the sugar mixture, do both sides of donuts. Dip the donuts in the cinnamon sugar mixture. Enjoy. They are best the first day. Keep them well covered. LOVE SEEING AND SHARING YOUR CREATIONS! Enjoying Baked Apple Cider Donuts, giving it a 5-star rating and any comments are super helpful for me and very much appreciated! Baked Apple Cider Donuts are the most amazing treat for a cool fall or winter day! Made with real apple cider, these donuts are just delicious! These donuts blow away any store bought donuts. 4 Tablespoons unsalted butter, room temperature. Preheat the oven to 350 degrees. Spray a donut pan with non-stick spray, set aside. 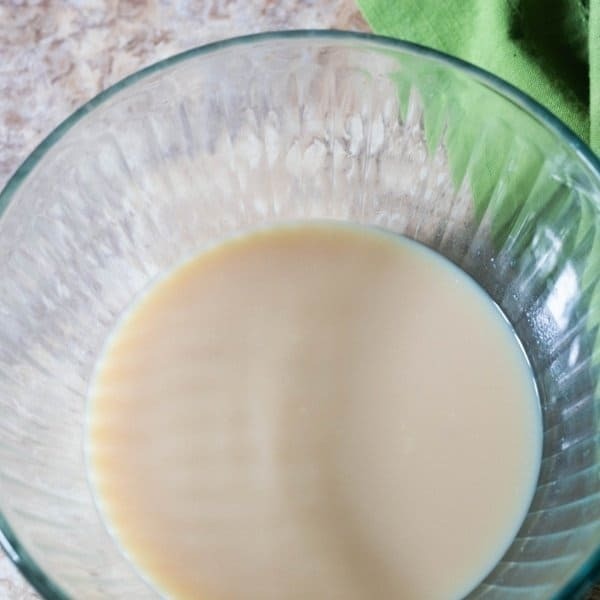 In a medium bowl combine apple cider, buttermilk, and vanilla. Set aside. In a stand mixer or large bowl blend unsalted butter, white and brown sugar until fluffy. Add in eggs, one at a time. Blend until well mixed. At the lowest speed on mixer add 1/2 flour mix and 1/2 cider mix. 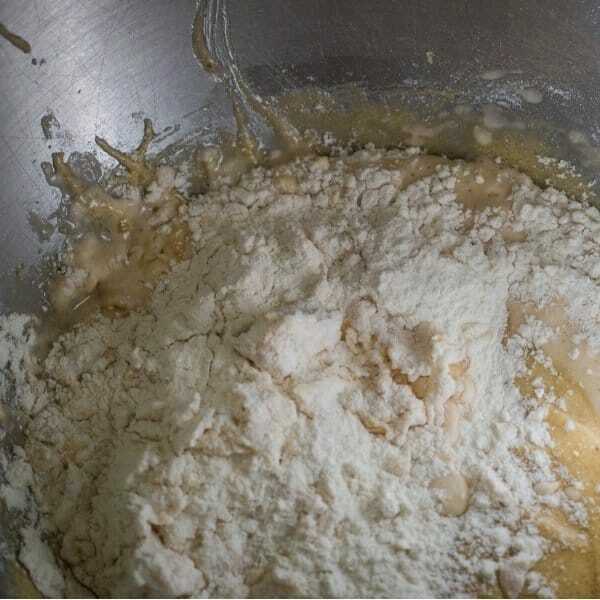 Blend, then remaining flour and cider mix. Fold ingredients to blend. Bake for about 15 minutes. A toothpick would be clean after sticking it into the donut. Let donuts cool about 3 minutes on a cooling rack. While the donuts are baking, melt the butter in a small saute pan. 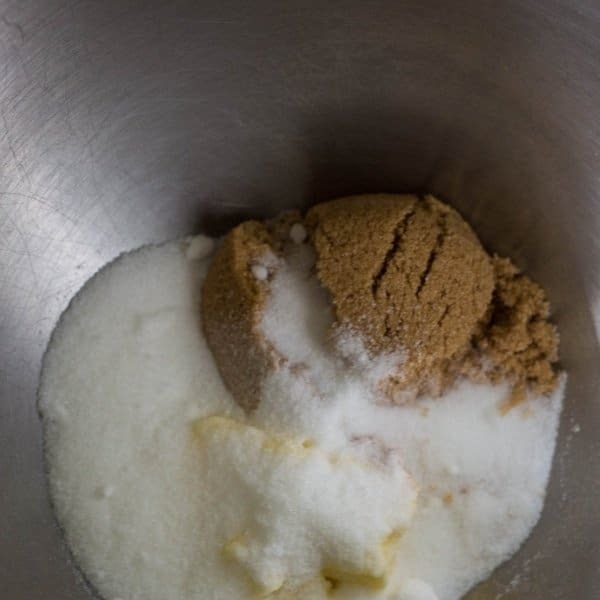 In a small bowl, combine the white sugar, brown sugar, cinnamon, and nutmeg. While the donuts are warm, brush them with the melted butter and then dip the donuts in the cinnamon sugar. Place them back on the cooling rack. The donuts can be eaten when warm. Note 1: The donuts are best the first day. Keep them well covered on day 2. Note 2: These donuts freeze well. Wrap each donut with plastic wrap then place in a labeled freezer storage bag. They keep well for 3 months. Note 3: To defrost, place in fridge overnight. I place in a 300-degree oven wrapped in aluminum foil for a few minutes. As it is #appleweek, we have amazing sponsors who given us amazing products to have a great giveaway! If you have not entered yet, be sure to enter for amazing prizes. For the complete list of prizes from all of our amazing sponsors, click on Sunday’s recipe! #appleweek my mom made apple brown betty from her well-worn/loved Betty Crocker cook book. Loved it! Ah, Barrie, I love me Betty Brocker Cookbook too! I was given that one and Joy of Cooking when I was about 12 years old. Still my favorites! Thank you so much for taking the time to leave me a comment! You also brought me back to awesome childhood memories! what a great recipe. have never trider cider donuts before. will try this sure. especially as i can make them before n store. I hope you enjoy the recipe Aditi! Let me know how it works for you! 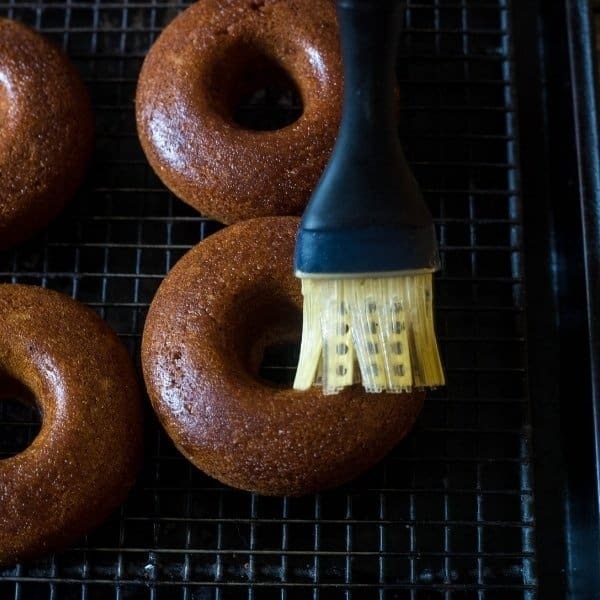 What a great tip on making donuts ahead of time and freezing them – I never would have thought about doing it! Yes, Julie! Make these donuts ahead of time and freezing is so easy to do! Glad you enjoyed the tip! These doughnuts looks so perfect. I wish I could grab one. Love the detailed steps. Can’t wait to try your version. Yummy! These look incredible. I’ve never had apple cider doughnuts but I absolutely want to now! Amazing photography too. Thank you so much for your comments Emily! You are so kind! I am glad you are enjoying my recipe and photography! I so agree Tammy! 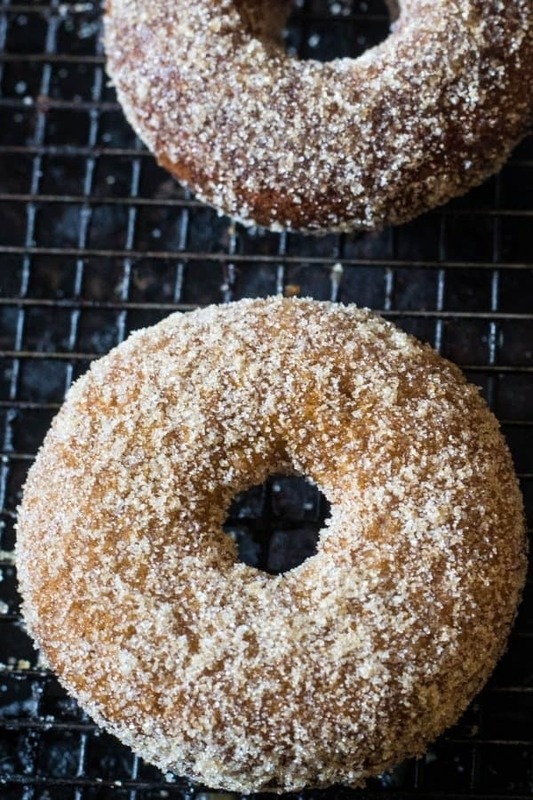 These apple cider donuts are a perfect morning treat! Apple cider donuts are one of my very favorite fall treats! I love this recipe allowing me to make them at home when I get a craving. Sharon, I am glad you are enjoying the cider donuts! 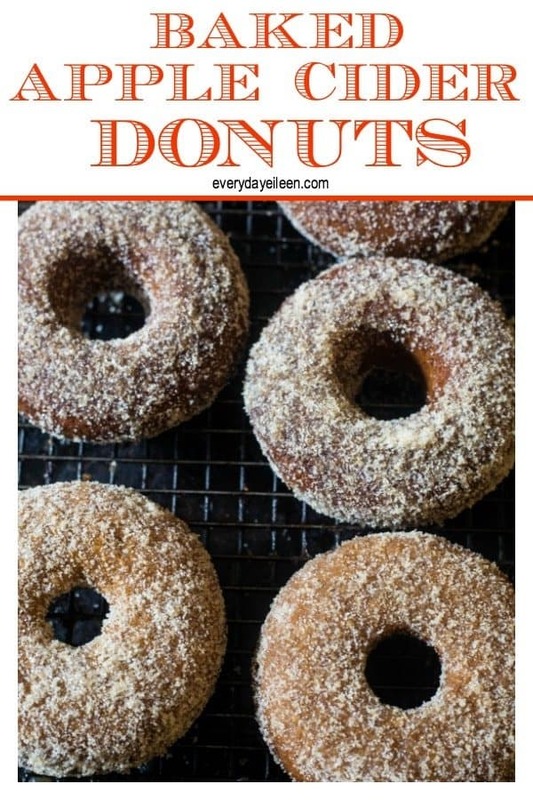 A game changer making your own donuts at home! These are delish! Oh, yes! Never mind all that spice coffee stuff – I know it’s Fall when I get fresh apples, then fresh cider, and – if I’m lucky – cider donuts. Fall classic, back when I lived in the Northeast… So now I can make my own luck, and my own donuts! I am right there with you Anne! So happy you enjoy the cider donuts! These are a family favorite! Eva, thank you so much for your lovely comments on the cider donuts! These are delicious and I agree, the sugar topping is amazing! these look SO good! I’ve never made donuts before but I’d love to try these! I just need to get a donut pan! Thank you Georgie! So glad you enjoy the donuts! Could these look any more delicious? I love that they are baked and that butter glaze in the end? OH MY, that must really take these to the next level! Thank you Kiki! Yes, these are our favorite donuts! The sugar topping is amazing too! These donuts sound absolutely perfect for fall. Love all the flavours in here – great recipe! Thank you, Courtney! I am so glad you enjoy the cider donuts! So appreciate your comment! These donuts are the epitome of Fall to me! They look perfectly fluffy and cinnamon sugary…. droool! I’d love these for breakfast over the weekend with some tea! Awesome Dominique, that is exactly how I love these donuts! With a cup of tea or hot cocoa! Apple week sounds like my kind of week! I love apple cider anything AND doughnuts. Baked doughnuts are a nice option to save yourself a few extra calories from the fry oil, can’t wait to try. I so agree Lauren! I hope you try these donuts! They are delicious! Perfect treat for around the campfire. Thank you Wendy! I am so glad you enjoy these donuts!